We know that this privacy notice is too long, and that’s why no one bothers to read this document. Therefore, we decided to write this section that gives you a quick overview about the data that is collected by this website. Analytics. We use three product that gather information about the visitors of this website: Google Analytics, Youtube, and Wistia. We use Google Analytics for gathering information about the anonymous users of this website. Note that we use IP anonymization, we don’t track authenticated users, and we honor the Do Not Track (DNT) header. We use Youtube for broadcasting our live webinars. When a user watches a live webinar or a webinar replay, Youtube gathers analyticts data about the user’s activity. We use Wistia as our video platform. When a user watchers a lesson, Wistia gathers analytics data about the user’s activity. Because we use Wistia’s privacy mode, Wistia won’t collect any personally identifying viewer data. This means that Wistia player anonymizes IP addresses, and disables both session and cookie tracking. Backups. We take regular backups because we want to be able to recover from incidents that lead into loss of data. These backups contain all files of the website and the full content of its database. All backups are stored in encrypted hard drives. Email. We use two different email services: Drip and Mailgun. If you subscribe to the course’s newsletter, we transfer your information to Drip. Drip allows us to send email newsletters to our subscribers, but it also gathers statistics about the email activity of our subscribers. If you write a testimonial, we will use Mailgun for sending an email that allows you to accept or reject the testimonial that is shown on the course’s website. Payments. When you purchase this course, your information is transferred to Stripe and Taxamo. Stripe is a payment gateway and we use it for processing credit card payments. It will also provide security measures that protect people from becoming a victim of credit card fraud. Taxamo allows us to determine the correct VAT that must be paid to the EU member country where you are located. It will also collect the evidence that’s required by the EU VAT rules. Security. We use the Wordfence WordPress plugin that provides additional protection for this website. This plugin analyzes all incoming HTTP requests and collects data that is required to identify and block malicious traffic. Also, we log all incoming HTTP request to so called access logs. Testimonials. A student who have purchased this course can give us a testimonial which helps us to market this course. If a user decides to so his/her testimonial is saved to the database of this website. We can use this testimonial in our marketing efforts after the student has given us his/her permission to do so. User account. When you purchase this course, you have to create a user account and your order is saved to the database (we don’t save or log your credit card information). Also, we use Learndash as a learning management system (LMS), and it collects the information that helps you to track your progress and ensures that you can see the content of the purchased package. Webinars. We use WebinarJam as our webinar platform. When you register to our webinar, your information is transferred to WebinarJam. If you participate to a webinar, WebinarJam collects analytics information about your webinar activity. The customer and student register of the Test With Spring Course. The data that is collected by Koodikupla Oy or send to third parties, is either received from the user or determined from the data given by the user. The exact data sources of the collected data are described in the following sections. The collected data is extracted mainly from the incoming HTTP request. Also, before the Apache HTTP server returns the response to the client, it will extract the returned HTTP status code and the size of the returned response, and write this information to the access log. We collect this data because we have a legitimate interest to prevent abuse. We store old access logs for one month. The Wordfence WordPress plugin provides additional protection for the testwithspring.com website. This plugin identifies malicious traffic and blocks IP addresses that send this traffic to this website. We can also block IP addresses manually by creating so called block rules. This data is extracted from the malicious HTTP request or given manually by an administrator. The country of the IP address is determined by using an IP location finder. We collect this data because have a legitimate interest to prevent abuse. If the block rule is created automatically by Wordfence, it is stored for 24 hours. If the block rule is created manually, it will be stored indefinitely. When a student purchases a package of the Test With Spring course, Learndash saves this information to the database. After a student has finished a lesson or a topic, he/she can mark it as completed by clicking a button found from the user interface. A package is considered as completed if a student has finished all its topics. After a student has finished a lesson, he/she can answer to the assignments given to the student. Ensure that a student can access only to the lessons which belong to the purchased package. Help our students to track their progress. Provide assessment feedback to our students (add comments to their assignment answers). This data is stored indefinitely. The Wordfence WordPress plugin provides additional protection for the testwithspring.com website. This plugin has a firewall that keeps track of the HTTP requests send to course’s website and blocks malicious HTTP requests. This data is extracted mainly from the incoming HTTP request. The city and country of the IP address are determined by using an IP location finder. Also, the returned HTTP status code is extracted from the returned HTTP response. We collect this data because we have a legitimate interest to identify and block malicious traffic. This data is stored for one week. The Wordfence WordPress plugin provides additional protection for the testwithspring.com website. This plugin keeps track of login attempts and blocks login attempts if it suspects that someone is trying log in by using a brute force attack. A boolean which is true if the user is an existing user and false otherwise. The outcome of the login attempt (success, failed). This data is extracted mainly from the HTTP request which is send to the testwithspring.com website when a user submits the login form. The outcome of the login attempt and the boolean flag (existing user) is determined from the result of the login attempt. We store this data for three months. We have implemented our opt-in forms by using the Thrive Leads WordPress plugin. This plugin gathers statistics about the conversation rates of our opt-in forms and stores the email address of every student who subscribes our email newsletter. Thrive Leads collects the following data when the user submits an opt-in form. The collected information is given by the student when he/she subscribes our email newsletter. The email address is given by the student when he/she subscribes our email newsletter. The lead group / short code and the type of the opt-in form is determined by Thrive Leads. The referrer URL is extracted from the incoming HTTP request. We collect this data because we have a legal obligation (Article 7 of EU GDPR) to prove that a person has given us his/her consent to send email to him/her. This data is stored as long as the subscriber has confirmed his/her subscription by clicking the opt-in link found from the confirmation email. However, because it would take too much time to delete this information one row at the time, we clear the content of this database table once a week. This data is given by the student when he/she purchases this course. The payment information is provided by Stripe. We collect this data because we have a legitimate interest to show the order history on the student’s profile page. This ensures that a student has an easy way for accessing his/her order history. We use a WP plugin called Thrive Ovation that allows use to gather testimonials from our students and show these testimonials on the testwithspring.com website. This data is given by a student when he/she submits the testimonial form. Also, we might request a photo from the student if he/she hasn’t provided it when he/she wrote the testimonial in question. When a student submits the testimonial form, he/she gives us his consent to collect the information given by him/her and save this information to our database. Also, before a testimonial is used on our marketing material, the student receives an email which allows him/her to either accept or reject the testimonial. We collect this data because we want to collect feedback from our students and use this feedback on our marketing material. This information is stored indefinitely. The collected data is given by a student when he/she purchases this course. We collect this data because we have a legitimate interest to ensure that only authorized persons (our students) can access the material of this course. The collected data is read from Stripe and Taxamo. However, it is was originally provided by the student when he/she purchased this course or determined from the provided data. We collect this data we have a legitimate interest to automate the sales report creation process. We store this data for ten years after the fiscal period in which the purchase was made has ended. We transfer this data to Defiant because we have a legitimate interest to identify and block malicious traffic, and Wordfence helps us to do it. Typically the collected data is deleted after 90 days because it is no longer needed. However, if the IP address continues to be involved in malicious activity, it might be added to the Defiant’s blacklist. If this happens, the data will kept as long as the IP address will be kept on the blacklist. This section identifies the information that is collected by third parties which we use to gather information from the users of this website. This website uses Google Analytics for gathering information from the anonymous users of this website. The tracking script of Google Analytics is run on every page view. Google Analytics identifies the user by using cookies and the gathered information is send to Google’s servers which can be located in the United States. Google will use this information for providing us different reports from our visitors. These reports are used to compile visitor statistics and improve our service. We don’t track authenticated users. The GA tracking script is not loaded if the user in question is logged in. We don’t use the advertising features of Google Analytics. In other words, we don’t see the demographics and interest reports. We don’t use Google AdWords. Also, we honor the Do Not Track (DNT) header. If a user signals that he/she doesn’t want to be tracked, our website doesn’t load the Google Analytics tracking script. Events. We use events for measuring the conversion rate of our landing pages. The demographics and interest information of the user. Google can gather this information if the user has visited other websites which belong to the Google Display Network. The gathered data is anonymized and Google doesn’t gather data about actual website visits or individual visitors. This information is either extracted from the incoming HTTP request or determined from it. Measure the conversion rate of our landing pages. Identify the traffic source which sends the traffic that has the highest conversion rate. The email address of the student. The time zone of the student. The method that was used to subscribe the newsletter. Tags which are used segment subscribers to different groups. For example, a tag can identify the package purchased by the subscriber (starter, intermediate, and master). A list of emails send to the student. A list of emails which were opened by the subscriber. A list of emails which contained a link that was clicked by the subscriber. A list of trigger links clicked by the subscriber. A list of subscribed email campaigns. Our student. The email address is provided by our student. When a student opens our email or clicks a link found from our email, Drip updates the open and click statistics of the email in question. Drip. A list of emails send to the student is updated by Drip when we send a new email to the subscribers of our newsletter. An administrator. When a student subscribes our newsletter, the administrator adds the correct tags to the student. Every time when a new lesson is added to the course or the information of an existing lesson is updated, we send an email to the students of the course. We notify the students of the course about upcoming maintenance breaks. We notify the students if our website is down. We send monthly webinar invitations to the students who have enrolled to the master package. Second, we segment our subscribers to different groups because this allows us to send relevant information to our subscribers. For example, if we add a new lesson to the master package, we can notify only the students who can access it. Third, we use the open and click rates for improving our communication. We want to provide useful information to our students and these two statistics help us to achieve this goal. We collect this data because the subscriber has given us his/her consent to do so. When a person subscribes our email newsletter, he/she has to confirm his/her subscription by clicking the confirm link found from the confirmation email. This data is stored as long as the subscriber is subscribed to the newsletter. When a subscriber cancels his/her subscription, we store this data for 30 days before it is deleted permanently. Mailgun adds this information to its internal log (expect the message body). This log contain also other information such as as the delivery status of the email. The collected data was given by the student when he/she wrote a testimonial. Also, an administrator might have might made some changes to the actual testimonial. We can send this data to Mailgun because a student has given his/her consent to do when he/she submits the testimonial form. This data is stored for 30 days. Before we will describe the information that is transferred to our payment and accounting partners, we will explain how this information is collected. The browser opens the sales page which has tax free prices. 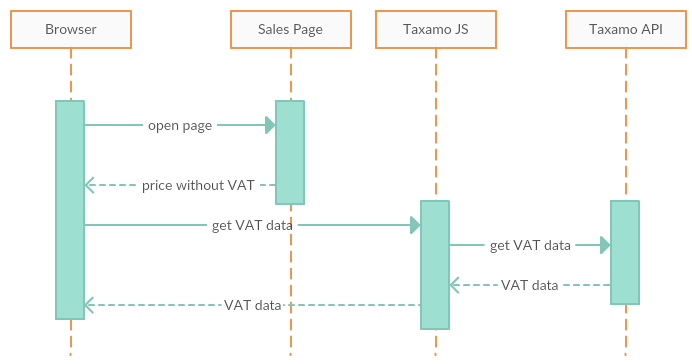 After Taxamo has returned the VAT data, the taxamo.js will replace the tax free prices with prices which include VAT. The browser requests the checkout page. The testwithspring.com website gets the VAT data from Taxamo. Again, before Taxamo can return the VAT data, it has detect the user’s country by using IP geo-location. The testwithspring.com website returns the checkout page to the browser. Note that this page contains the VAT data returned by Taxamo. User fills checkout form and clicks the ‘Place Order’ button. The testwithspring.com website creates a new Taxamo transaction and a new Stripe payment. User is forwarded to the ‘Order Received’ page. This page displays the information of the received order. Note that this description describes the happy path. If the user’s VAT country cannot be detected by using IP geo-location, he/she can set it on the checkout page. This means that the VAT data will be fetched from Taxamo for the second time. Also, if the payment fails, user can try again. 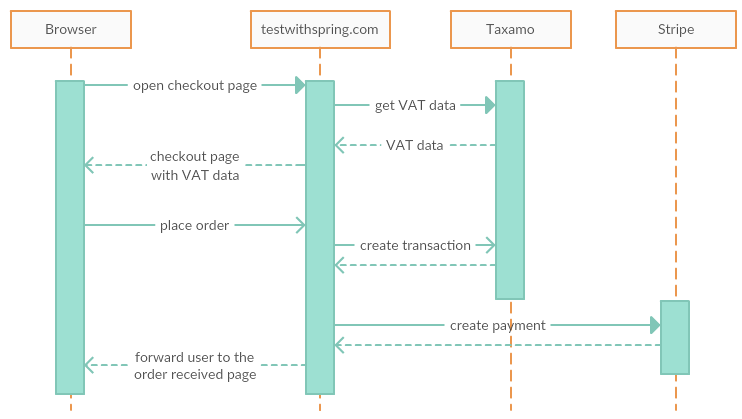 If the user decides to do so, the testwithspring.com website will create a new Taxamo transaction and a new Stripe payment. First, If a user opens our sales page and doesn’t purchase this course, only the IP address of the user is send to Taxamo. This data is either given by the student when he/she purchases this course or determined from the given data. For example, the VAT country, VAT percentage, and VAT amount are determined from the data given by our student. We must display the price that includes VAT on our sales page because this is required by the consumer protection act. We use this information as a voucher that identifies the transaction. This is required so that we can fulfill our legal obligations concerning accounting. We collect this information because we have to identify the customer’s location. We need to this because the European Union VAT rules for selling digital goods required that we pay the VAT to the country in which the course is consumed. In other words, Taxamo helps us to calculate the VAT charged from the customer and stores the evidence that allows us to pay the VAT to the correct country. Section 8 of the chapter 2 of the consumer protection act (20.1.1978/38). Note that the English transaction of this act is also available. However, this translation is not up-to-date and doesn’t contain the latest changes made to the consumer protection act. Section 5 of the chapter 2 of the accounting act (1620/2015). Note that the English transaction of this act is also available. Chapter 12 a of the value added tax act (30.12.1993/1501). Note that the English translation of this act is also available. We have to store this data for ten years after the fiscal period in which the purchase was made has ended. Card number (only the last four digits are visible to us). This data is either given by the student when he/she purchases this course or determined from the given data. We have a legal obligation to use this data as a voucher that links the payment to the Taxamo transaction. We have to store this data for ten years after the fiscal period in which the purchase was made has ended. However, keep in mind that Stripe has its own legal obligations and these obligations define the real retention period of the collected data. This data is created by our sales reporting software. They do our VAT reports and send them to the tax authorities. Accounting act (1620/2015). Note that the English transaction of this act is also available. This data is stored for ten years after the fiscal period in which the purchase was made has ended. The collected data is either given by the student when he/she registers to the webinar or collected by WebinarJam when a student attends to the webinar. We have to send a webinar invitation and reminder emails to the students who have registered to a webinar. We gather analytics about the behavior of our students because this information helps us to provide interesting content to our students. We can collect this data because a student gives us his/her consent to do when he/she registers to a webinar. We use Youtube for broadcasting the live webinars. Also, webinar replays are uploaded to Youtube and embedded to the testwithspring.com website. The identity of the user. If a user is logged in to his/her Google account, Youtube will know what videos he/she is watching. If a user is not logged in to his/her Google account, Google might identify the user by using its tracking cookies. This data is collected from our students. We collect this data because we have a legitimate interest to share the webinar replay with students who couldn’t attend to the live webinar. We host our videos on Wistia’s video platform. Because we use Wistia’s privacy mode, Wistia won’t collect any personally identifying viewer data. This means that Wistia player anonymizes IP addresses, and disables both session and cookie tracking. The anonymized IP address of the user. The location of the user. This information is determined by using IP geo-location. Note that Wistia cannot collect the exact location of the user because the IP address is anonymized. The internet service provider of the user. This information is determined from the IP address of the user. The browser used by the user. The device used by the user. A heat map which identifies the watched sections. We don’t track the email addresses of the people who watch our videos. Wistia has a feature that would allow us to do this, but we don’t use it because we don’t want to violate the privacy of our users. We don’t use the Google Analytics integration provided by Wistia. We collect this information because we have a legitimate interest to provide more interesting content for the users of our website. The data collected by Google Analytics and Youtube. Note that Google complies with the EU-US and Swiss-US Privacy Shield Frameworks. The data collected by Drip. Drip is a U.S. company and the data that is collected by it is processed in the United States or any other country in which Drip or its subsidiaries, affiliates or service providers maintain facilities. The data collected by Mailgun. Mailgun is a U.S. company and the data that is collected by it is processed in the United States or any other country in which Mailgun or its subsidiaries, affiliates or service providers maintain facilities. The data collected by Stripe. The entity that provides services in Europe is Stripe Payments Europe that is located in the republic of Ireland. However, the collected data may be stored and processed in any country where Stripe or its service providers have operations. Also, Stripe complies with the EU-U.S. Privacy Shield Framework and the Swiss-U.S. Privacy Shield Framework. The data collected by WebinarJam. Note that Genesis Digital (the company that owns WebinarJam) is a U.S. company and it complies with the US-EU Privacy Shield Framework and Swiss-US Privacy Shield Framework. The data collected by Wistia. Wistia is a U.S. company and the data that is collected by it is processed in the United States or any other country in which Wistia or its subsidiaries, affiliates or service providers maintain facilities. The attack data collected by Wordfence. Note that Defiant (the company behind Wordfence) is a U.S. company and the data is processed in United States or any other country in which Defiant or its subsidiaries, affiliates or service providers maintain facilities. Note that Defiant has applied for the Privacy Shield certification program for both EU-US and Swiss-US, and they are waiting to be certified. We take periodical backups from the database of the testwithspring.com website. These backups contains all data that is collected by the testwithspring.com website. We have to take these backups because we have a legitimate interest to recover from accidents that lead into loss of data. Each database backup is stored for one month. When this period is over, the backup will be deleted. We take these backups because this material is the “source material” that is used to do our book keeping, and we have a legal obligation to keep it safe. These backups are stored for ten years after the fiscal period in which the backup was made has ended. This section describes the principles which we use to protect the data that is collected by us. All communication between a web browser and the testwithspring.com website uses HTTPS. Every user (either a student or an administrator) has a username and a password that are used to log in to to the course website. This password is hashed with bcrypt. A student can access only his/her own information. The testwithspring.com website has a firewall that protects it from malicious traffic and blocks brute force attacks. The testwithspring.com website uses a malware scanner that performs regular malware scans. The testwithspring.com website sends automatic email alerts to the administrator when a WordPress plugin update is available. Only the administrator of the Test With Spring Course has the required permissions to access all information stored the database of the testwithspring.com website. The information is saved in a database that is protected with username and password. Only the administrator of the Test With Spring Course has access to this database. The database server and web server are located in Finland at locked and guarded premises. Only authorized personnel are allowed to access these premises and the information stored on these servers. We minimize the number of persons who can access the collected data. At the moment only one person (Petri Kainulainen) can access it. All communication between the administrator and a remote system happens by using HTTPS. All backups are stored in an encrypted hard drive. If a file is transferred to a cloud storage, it is encrypted before it is transferred. Sensitive information (such as password or a credit card number) is never written to a log file. All communication between the testwithspring.com website and an external system uses HTTPS. All HTTP requests send to external systems are authenticated by using authentication mechanism supported by the external system. You have the right of access your personal data that has been collected by us. You can obtain a copy of your personal data by sending a signed letter to the person who is in charge of the collected data. This letter must contain the information that allows us to identify you. You can obtain your personal data free of charge once per year. Your request is processed within 30 days of receiving your letter. You have the the right to rectify incorrect data or complete incomplete data. If you want to exercise this right, you have to contact the person who is in charge of the collected data. Your request is processed within 30 days. You have the right to have your personal data erased. You can have your personal data erased by sending a signed letter to the person who is in charge of the collected data. This letter must contain the information that allows us to identify you. Your request is processed within 30 days of receiving your letter. Note that if you want to erase the data collected by Drip, you don’t have to send us a signed letter. You can simply unsubscribe our newsletter and you data will be erased. You have the right to restrict the processing of your personal data. If you want restrict us from processing your personal data, you have to send a signed letter to the person who is in charge of the collected data. This letter must contain the information that allows us to identify you. Your request is processed within 30 days of receiving your letter. You have the right to data portability. This means that you can obtain the collected data in a machine readable format. You can obtain a copy of your personal data in a machine readable format by sending a signed letter to the person who is in charge of the collected data. This letter must contain the information that allows us to identify you. Your request is processed within 30 days of receiving your letter. You have the right to object the data processing based on legitimate interest, direct marketing, and data processing for purposes of scientific/historical research and statistics. If you want to exercise this right, you have to contact the person who is in charge of the collected data. Your request is processed within 30 days. Also, if you think that we are processing your personal data in a way that breaks the law, you have the right to file a complaint to the office of the data protection ombudsman.